English: Don’t Meddle with it! 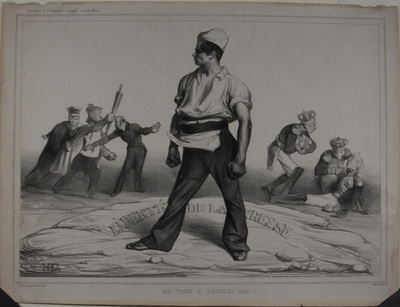 The central figure in this well-known Daumier lithograph is a printer, who stands firm in support of freedom of the press, while King Louis Philippe (to the left) charges at him with a raised umbrella. On the ground (to the right) is former King Charles X, who was deposed by the Revolution of 1830. Daumier’s defiant printer appears to proclaim his power to oust the leaders of nations.